Tom: This port of the 2012 Vita game explored stealth in more interesting ways than any of the other games on the list. As Aveline you can change clothes to present yourself as a slave or a wealthy lady, manipulating NPC’s assumptions to access restricted areas and get closer to targets. A lack of changing stations means changing appearance is a bit of a faff, but the main problem is the game’s origins on a handheld system. Spectacle is an important part of Assassin’s Creed’s appeal, and Liberation struggles to deliver on a modern PC monitor. Tom: Paris is my favourite Assassin’s Creed city. It’s absolutely gorgeous, even in the slum areas. Sadly it was an overambitious project and the game suffered from a ton of technical problems. The involved loot system hinted that the series might move into RPG territory long before Origins arrived, but it wasn’t particularly interesting. Arno was a complete nobody and the story is chronically dull. A real missed opportunity given the beautiful setting. Samuel: The third game brought us a beautiful world, but one that felt so devoid of interactivity that you might as well have not been there at all. It's a criticism I'd level at the combat, too. I remember Assassin's Creed 3 as a game that plays itself against a beautiful backdrop. But hey, it did debut the boat combat systems that would be built upon in Black Flag (then turned into its own game with Skull and Bones), where the idea of fighting other ships actually made sense. 3 also loses points for having a deeply boring protagonist. Tom: Assassin’s Creed 3 has some of the worst missions in the whole series, full restrictive invisible walls, unclear instructions and boring tasks. The game implies that you can hunt redcoats for supplies in wild, wintry forests, but the reality is far more bland, and the towns aren’t as exciting to explore as London, Paris, Venice, or Rome. It’s a shame, because few games tell stories about colonialism, but AC3 manages to make it boring. It’s quite buggy, too. Tom: An average retread of Black Flag in dull wintry tones. The ship combat is still fun, but it’s impossible to escape the de ja vu if you’ve played and enjoyed Assassin’s Creed 4 already. Tom: I’d be tempted to argue this should be higher, though I think if you were going to play an AC game right now Revelations, the third part of the Ezio trilogy, would be a tough recommendation. This game is crowded with unnecessary features and tedious distractions. The tower defence minigames were rubbish, for example, and the crafting system was laboured. The big gimmick in this one was a hookblade that let you scoot down ziplines that someone spread across the rooftops of Constantinople. Those are quite fun, and you get to hang around with Leonardo Da Vinci, and Revelations features some of the craziest action sequences in the series. Overall, however, it's a bit of a muddle. Samuel: London is a dazzling setting, and the idea of two main characters works well, as does the rope launcher that lets you reach high locations easily. Origins has since refined the series' ancient combat, though, which was getting a bit creaky in this entry. Tom: After the letdown of Assassin’s Creed Unity, the series was getting wearying at this point. The sibling assassins at the heart of it were a fun pair, but I didn’t find London to be as fun to clamber over compared to other cities. Syndicate did so little to advance the formula and distinguish itself from the rest of the games it ended up being oddly forgettable. Yet again there were problems with bugs in certain missions. It had more flair than Rogue, though, and was less wonky than AC3. Samuel: Brotherhood depicts Rome really well, but I prefer having multiple cities to explore in Assassin's Creed rather than just one, putting the second game ahead for me. Calling in assassins with a single button press to do your dirty work feels empowering as heck, though. Tom: I became obsessed with building Rome, building up my assassin school and finding the little tombs hidden around the city. I wish more games would steal the command that summons an assassin from a nearby bin. It feels badass, and I like seeing how the game will figure out where the assassin leaps out from. Sorry, guard, it turns out an assassin has been waiting in that trough since daybreak waiting for me to turn up and whistle. Chris Livingston: It's just great that we can still be completely blown away by a game world. Just floored by it. Considering how far games have come, and how many we've played, and all the different sights we see on a regular basis, to just be rocked back on our heels, stunned by the beauty and detail and scope of a location like we are in Origins. Tom: I couldn’t get on with the combat or the level gating of enemies but visually Origins sets a new standard for Assassin’s Creed. None of the other games capture the bustling ambience of a marketplace quite as well, and I love the ability to hop from dusty ground level to an eagle-eye view of Egypt. Samuel: A consistent and engaging action-adventure with a lively setting, a likeable protagonist and a decade-long revenge tale. Tom: Venice is a beautiful setting for a game, and it’s a pleasure to explore it as the jovial Ezio. Personally I prefer Brotherhood because I enjoyed collecting assassins like Pokemon, but 2 has the better story, and it’s the point where the series really gains some personality. The first game could feel like a tech demo waiting to become a game, 2 lives up to the promise. Andy K: In many ways, this is the peak of what Ubisoft has achieved with Assassin's Creed. It's clear RPGs such as The Witcher 3 and Mass Effect have been a great influence on the direction of the series, with richer, freer quests, a bigger, more interconnected world, accessible character customisation, and dialogue options. Odyssey is probably slightly too long, but it's a big, beautiful, sweeping adventure set in a vivid, mythical vision of ancient Greece. It feels like the least historically accurate Creed yet, to the point where Greece and its scattered islands might as well be a fantasy setting in places. But that works in its favour, making for a gorgeous world to journey across. Throw in that brilliant Exploration Mode, which gives you geographical clues to where an objective is rather than pointing a marker at it, and you have an incredibly fun, rewarding open world. But Black Flag just beats it for me, purely because the piratical theme and Caribbean setting are a touch more compelling and well-realised. It's a close call, though. 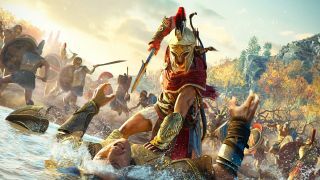 Jody: Part of what's interesting about Assassin's Creed is the idea each game can explore vastly different time periods, but the series' formula has a flattening effect on that. Sometimes they feel samey no matter how unusual the setting. Black Flag's the exception because the Golden Age of Piracy isn't just a backdrop to parkour over, performing air-assassinations off the top of Blackbeard's hat. Once you've done a bit of the assassins vs. templars stuff at the start it goes whole hog on letting you be a pirate captain, like you've eaten your vegetables and now here's your rum-flavored dessert. Chris: When we played Assassin's Creed 3, we all had the same thought: this ship stuff is awesome. Why don't they make a whole game out of it? Dreams come true. Tom: Collectible sea shanties! Too many games overlook the value of a good shanty, but not Black Flag. You can also wear four pistols on your chest and use them in hand-to-hand combat! And you can hunt ghost ships on the high seas! I agree that the story is a slog, but at least Kenway has some vigour, and the game gives you so many ways to sail off into adventure. Black Flag makes me crave a dedicated pirate series with these production values, one that doesn’t have to worry about all that Assassin vs. Templar silliness. It’s odd that the Assassin’s Creed game we love the most is the one that cares least about Assassins, but there you go.